What a great story, Shallee! I love how a book was your writing catalyst. This was such a fun blogfest! The Giver is such a fascinating book. I first read it in college, after having discussed Plato's Republic in class and hearing all my classmates compare it to The Giver! Thanks for sharing the beginning of your journey! stories touch us in so many ways! glad you found your niche, i need to take another class! Love your determination! Don't ever give it up. A class with Brandon Sanderson? Who could pass that up? And I dig your new word - smashtastically! I, like you, have been writing for a long time. For me it wasn't until I put myself out there with a blog that I finally got serious about it. great post! I love that you mentioned this book at LTUE. It was the reason I was an English major. IT's one of my favorites, and the sad thing is I loaned it out a few years a back and never got it back. I need another copy! Oh, that's awesome! The Giver is such a thought-provoking book; I've read it so many times over the years. I love it when writers can point to one or two significant influences that have driven them to where they are today. 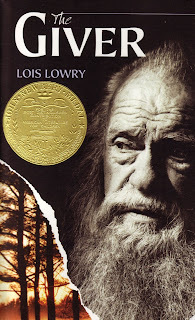 I wonder if Lois Lowry ever gets to hear those stories? The Giver is a great book. I'm glad it inspired you to jump into the world of writing! Love your blog layout--beautiful! Also, love the way you were finally able to put all those writing pieces together during that class. Nice to meet you via the blogfest. I'm dropping by from the origins blogfest. I love how the Giver started you writing. I adore that book! Fantastic. I love books that leave me thinking - although I don't love ones that leave me depressed. Very few have left me depressed, but many give me lots to think about. Love your entry Shallee. Great stuff. Aw! Great story! I wish I would have pursued writing sooner!! Sounds like you've been working on making your dream a reality ever since that first spark was lit. I think the one book that sticks with all of us into adulthood is The Giver! So wonderful! I love finding those books that inspire us to write better! Good luck! What a wonderful husband! Lucky girl!! You have a great Origins story. As your newest follower, I wish you all the luck on your journey to publication. I'm right there with you, sister! Awww! I love your Origin! And I'm a little sad to admit that I've never read The Giver. I think I better get on that. Like now. It was so much fun meeting you last week! There's always that one book, or story, author, or event that lights the 'spark':) And I think it's funny how many of us kind of gravitate back to the first genre that made us want to create. Thanks so much for sharing your origins! Yay fellow English majors! Love how many people had a love of the written word so early. Hooray for you! I love this book, I think we talked about that at the LTUE. I'm glad that you're writing because now are my new awesome friend! Have not read The Giver, but I will try to get a copy of it. It was nice to read all about your writing journey, Shallee. Oh my heck -- I LOVE THE GIVER. Everything about it, right now to the ambiguous ending. In fact, I found great comfort in it, because my books end in similar ways. And I want readers to contemplate them as much as I thought about THE GIVER. That one book I wanted to emulate didn't really hit for me until much later in life. Though there were certainly many classics that stuck with me, and truly changed my perception of the world, and me in it. I've never read 'The Giver'. It does sound familiar though. I'll google that one! Cool to *meet* your here in the Fest! That makes so much sense: your novel totally makes me think of The Giver.